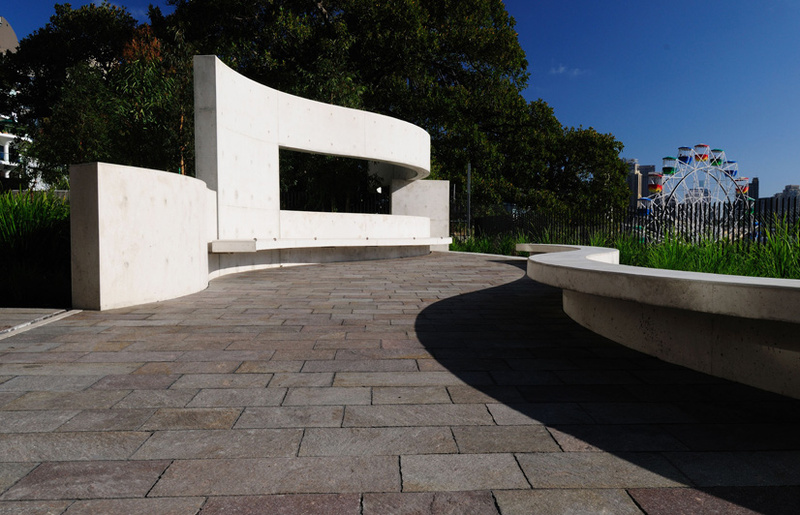 A new public park located at Milson’s Point in Sydney, overlooking the harbour, has been named in memory of celebrated Australian architect, Harry Seidler. The park – located beside the award-winning Seidler & Associates office – overlooks the harbour and Sydney’s Luna Park, and was officially opened by Penelope Seidler on 10 November. The urban park, designed by Seidler & Associates, features a 25-metre long concrete sculpture that snakes through the park, incorporating bench seating and serving as a public forecourt to the Sir John Sulman Medal-winning Seidler Office building. A sculpture by Australian artist Robert Owen, entitled Tracing Light – For Harry 3D/4D, complements the concrete structure of the park and the adjacent office building. Harry’s Park commemorates the life and work of Seidler, whose acclaimed projects include the Rose Seidler House, Australia Square and the MLC Centre in Sydney’s CBD, the Horizon Apartments and the Ian Thorpe Aquatic Centre.